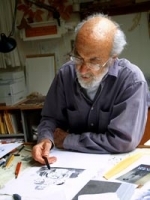 Marc Simont (November 23, 1915 – July 13, 2013) was a Paris-born American artist, political cartoonist, and illustrator of more than a hundred children’s books. Inspired by his father, Spanish painter Joseph Simont, he began drawing at an early age. Simont settled in New York City in 1935 after encouragement from his father, attended the New York National School of Design, and served three years in the military. P.G. Wodehouse shares his feelings after moving to the United States. The whole family -- three generations and the dog -- join together to make a rundown old house into a home. In the beginning when people and animals did not know each other the little girl sets out to find someone like herself.